The Amish Deluxe Gun Cabinet is the standard for top quality craftsmanship and is the perfect piece for any avid hunter or gun collector. This premium display cabinet is built with the meticulously detailed and handcrafted carpentry skills of our Amish woodworkers. Make this stunning wooden gun cabinet an heirloom in your home, hunting lodge, or business for generations. With a capacity to hold up to twenty rifles or shotguns, this Amish solid wood gun cabinet is one of our largest, with plenty of space for your firearms to be beautifully displayed and securely stored on the felt lined gun racks of this gorgeous American made wooden gun cabinet. The bottom two cabinets each come with an adjustable solid wood shelf for more storage options and the three pull out drawers are built using top-quality dovetail drawer construction and installed on full extension drawer slides with a soft-close drawer slides option. These bottom storage areas are perfect for securely storing your handguns, ammo and other firearm accessories. This large gun cabinet is built in two pieces with the top separate from the bottom for easier shipping and convenient access into your home. Once in place in your home, the top and bottom can be easily connected for a sturdy and secure frame for displaying your firearms. This Heirloom style gun cabinet is also available in a Mission or Traditional Contemporary style to match your home decor and personal style preferences. Safety first! All of the doors and drawers including the glass display doors of this Amish gun cabinet come standard with secure locks to restrict access to your firearms. One of the first rules of owning a firearm is to be responsible about where you keep your guns and to always store them unloaded with the ammo locked away in a safe place such as the bottom cabinets or drawers of this solid wood gun cabinet. The glass doors come standard with double strength glass and an option to upgrade to tempered glass for enhanced security and safety measures. . This is not meant to be a "gun safe" to prevent your firearms from being stolen. It's primary purpose is a display cabinet with additional safety locks so children or other unauthorized individuals won't have direct access your guns. 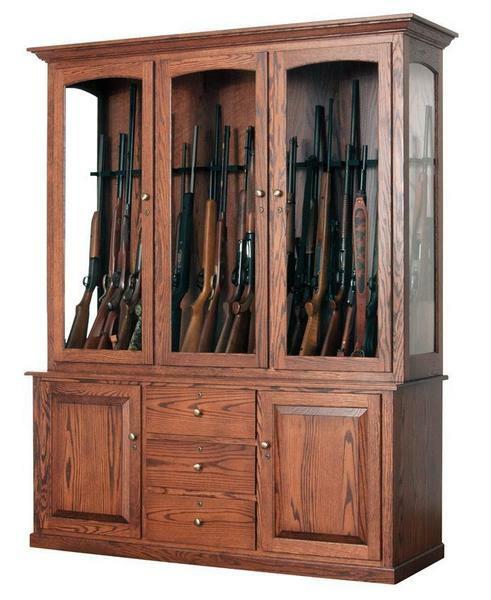 The Amish Deluxe Gun Cabinet shown is built using premium solid oak wood with the Boston 111 stain. Choose to have your custom gun cabinet built from the same wood and finish combination or choose from our other available hardwoods including brown maple or cherry wood and a finish type to create a custom look for your Deluxe Gun Cabinet that will match your personal style and home decor. Hardware Options - Choose the type of knob for the doors and drawers of your gun cabinet to add some classic accents to the piece. Our solid wood gun cabinets are handcrafted to order for each customer by expert Amish craftsmen from their wood shops right here in the heart of the United States. Your gun cabinet can be customized to your exact specifications and gun needs for a completely one-of-a-kind custom gun cabinet that is unique to your personal style preferences. Contact our friendly and knowledgeable furniture specialists for more information or custom ordering assistance on this beautiful piece of American made carpentry. Also, have wood and stain samples sent to your home or business to help make the decision process a bit easier. I was able to build my custom guitar cabinet at a fraction of what other places would have charged. I am thrilled at how you were able to take my vision and bring it to life. Thank you! ***PLEASE NOTE THIS CABINET WAS FULLY CUSTOMIZED TO THE CUSTOMER'S SPECIFICATIONS*** Shown in Brown Maple Wood with OCS-106 Acres Stain and our Standard Varnish.